GOLETA, Calif., April 9, 2014 /PRNewswire/ -- Deckers Outdoor Corporation (NASDAQ: DECK), a global leader in designing, marketing, and distributing innovative footwear, apparel and accessories, today announced the appointment of two senior executives who will play key roles in supporting the continued build-out of the Company's Omni-Channel infrastructure and resources. Brad Willis was appointed to Senior Vice President, Information Technology. Reporting to the Company's COO, Mr. Willis will oversee Deckers' IT operations, playing an important role in supporting the Company's Direct-to-Consumer expansion and continued transformation into an Omni-Channel organization. Among other initiatives, he will focus on strengthening Deckers' ability to integrate and streamline product sourcing and distribution across all channels, as well as further improve on the Company's various CRM and data analysis programs. John Kalinich was promoted to Senior Vice President, Omni-Channel Operations and E-Commerce, DTC. Mr. Kalinich previously served as Vice President of Consumer Direct. Reporting to the President of Omni-Channel, Mr. Kalinich will be instrumental in supporting the continued growth of Deckers' E-Commerce operations, which grew nearly 30 percent in 2013 and contributed just over 10 percent of the Company's total revenues. In his expanded role, he will focus on strengthening and innovating the Company's multi-brand online presence and executing strategies to further elevate the online component of the Omni-Channel experience. "The appointment of these talented executives reflects our companywide commitment to building the industry's most innovative and customer friendly Omni-Channel experience," said Angel Martinez, President, Chief Executive Officer and Chair of the Board. "We are devoted to bringing the same level of innovation, collaboration and vision that we bring to brand development to our selling, marketing and logistics capabilities. Brad and John will play key roles in the continued build-out of our infrastructure and resources to support our efforts to fully connect with and serve consumers online, in our retail stores and across our wholesale distribution platform." Brad Willis was previously Chief Information Officer & Vice President of Information Technology at West Marine, where he was responsible for the evolution and maintenance of the Company's major application platforms. Prior to joining West Marine, he had over 15 years of retail IT experience working in the LVMH Moet Hennessey Louis Vuitton Group. He held various positions within the Group in New York, Tokyo, and San Francisco. His most recent experience before coming to West Marine was as Vice President of Multi-Channel Systems in LVMH's Sephora USA division. He is a member of the NRF CIO Council. In his prior role as Vice President of Consumer Direct, John Kalinich led Deckers' worldwide E-Commerce operations and pioneered E-Commerce within the Company's wholesale structure. He held several previous positions with Deckers including Vice President of Intellectual Property and Licensing. He previously served as COO of Teva Sport Sandals, and in 2002 joined Deckers in connection with the acquisition of the Teva Rights. Prior to joining Deckers, he held various positions with Coopers & Lybrand, an international accounting and consultancy firm. He is currently a member of the Forrester ebusiness and Channel Strategy council, Flagstaff Forty Business Leadership Organization, Community Advisor to the Northern Arizona University W. A. Franke College of Business and is a certified public accountant. Deckers Outdoor Corporation is a global leader in designing, marketing and distributing innovative footwear, apparel and accessories developed for both everyday casual lifestyle use and high performance activities. The Company's portfolio of brands includes UGG® Australia, Teva®, Sanuk®, TSUBO®, Ahnu®, MOZO®, and HOKA ONE ONE®. 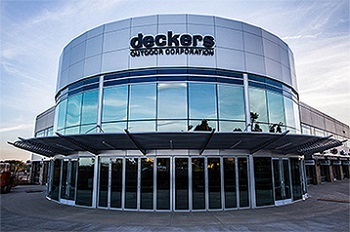 Deckers Outdoor products are sold in more than 50 countries and territories through select department and specialty stores, 117 Company-owned and operated retail stores, and select online stores, including Company-owned websites. Celebrating the 40th anniversary of its founding in 2013, Deckers Outdoor has a 40-year history of building niche footwear brands into lifestyle market leaders attracting millions of loyal consumers globally. For more information, please visit www.deckers.com.